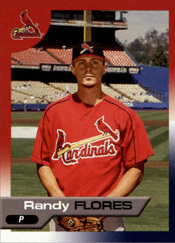 Randy Flores was the winning pitcher in one of the most dramatic postseason games played by the Cardinals. On Oct. 19, 2006, Flores pitched a flawless eighth inning, setting the stage for Yadier Molina and Adam Wainwright to lift the Cardinals to a 3-1 victory in Game 7 of the National League Championship Series against the Mets at New York. Nine years later, Flores, 40, played another prominent role for the Cardinals when he was chosen by general manager John Mozeliak to be scouting director, starting the job on Sept. 1, 2015. Flores, who earned an undergraduate degree in finance and a master’s degree in administration from the University of Southern California, was hired for the front-office role, in part, for his leadership and management skills, Mozeliak said to Dan McLaughlin in an interview for radio station KMOX. Flores’ skills in performing under pressure on the field passed the test in the epic pennant-clinching 2006 game at Shea Stadium. In the eighth inning, with the score tied at 1-1 and most of the 56,357 spectators howling for the Mets to take the lead, Cardinals starter Jeff Suppan walked the leadoff batter, Carlos Beltran. Next up for the Mets was cleanup batter Carlos Delgado, a left-handed slugger who’d been walked three times in the game by Suppan. Cardinals manager Tony La Russa replaced Suppan with Flores, a left-handed reliever. Delgado had hit three home runs against the Cardinals in the series. Flores struck him out on a slider in the dirt. Another power hitter, David Wright, was up next. A right-handed batter, Wright had driven in the Mets’ run in the first with one of their two hits in the game against Suppan. The matchup with Flores favored Wright. Right-handed batters hit .329 versus Flores during the season. La Russa could have brought in a right-hander to face Wright, but he didn’t because Shawn Green, a left-handed batter, was on deck. Rookie Tyler Johnson was the lone remaining left-hander in the bullpen. Preferring to stick with his veteran, La Russa gambled and let Flores face Wright. Flores struck him out on a slider. Beltran, who had 18 stolen bases during the season and one during the series, hadn’t budged off first base. Like Delgado and Wright, Green had the proven ability to drive in Beltran with an extra-base hit. Acquired by the Mets from the Diamondbacks in August, Green had produced 31 doubles and 15 home runs during the season. Flores got Green to ground out to first baseman Albert Pujols, ending the inning and emboldening the Cardinals with his shutdown performance. In the ninth, Molina slammed a two-run home run off reliever Aaron Heilman, giving the Cardinals a 3-1 lead and positioning Flores for the win. The win was the personal highlight of an outstanding 2006 postseason for Flores. Overall, he pitched 5.2 scoreless innings against the Padres, Mets and Tigers. Signed by the Cardinals as a free agent in November 2003 after spending the season in the Rockies minor-league system, Flores played five years (2004-08) with St. Louis and was 9-2 with a 4.35 ERA and three saves in 237 appearances.